Mort Kunstler Handsigned and Numbered Limited Edition Print:"Washington's Watch Chain"
Size: Print : Image size: 16" x 29-1/2" Overall size: 21" x 33-1/2" - Multiple Canvas Sizes availble. Select from Drop Down Box. Mort Kunstler's Comments: In October 2010, I accepted a commission from the Adjutant General's Corps Regimental Association to do a painting for placement in the Hall of Honor at the Adjutant General School at Fort Jackson, S.C. The painting would commemorate over 200 years of service by the Adjutant General's Corps to the United Sates of America. In conversations with Colonel Gary L. Gresh, the 20th Commandant, Adjutant General's Corps, Ret., we came up with the idea of George Washington at West Point, observing the removal of the Great Chain from the Hudson River. I knew very little about it, but I did find out that it had never before been painted! That was instantly exciting to me. The story of the chain is a fascinating one. During the Revolution, the British ruled the seas. The English with their Hessian allies, occupied Long Island and New York City. The Continentals held New England, New Jersey, and Pennsylvania. If the British could sail up the Hudson from New York City and connect with their forces in Canada, they would essentially be able to cut the United States in half. Washington endorsed a scheme that would string a giant chain across the river, resting on pine floats. The entire system of chain and floats had to be removed before the river froze over and then put back in the spring. If frozen into the Hudson, the chain would have been destroyed by the ice. That is the moment I chose to depict. "After taking special notice of Colonel Timothy Pickering's leadership abilities, General George Washington offered him the position of Adjutant General of the Continental Army in 1777. When Washington moved his headquarters to West Point, Pickering oversaw the construction of forts; batteries, redoubts and the �Great Chain' designed to block the British Navy from sailing up the Hudson River. Forged at Stirling Iron Works under Pickering's watchful eye, the chain was completed in six weeks. 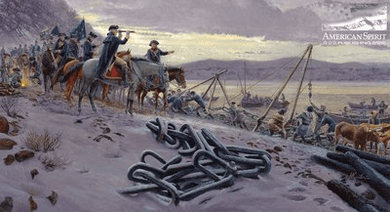 In spring of 1778, the heavy chain supported by huge logs stretched across the Hudson from West Point to Constitution Island, a point where the river narrowed and turned sharply to the west. The �Great Chain' protected the Patriot fortress from attack for the duration of the war." On December 15th, after a short drive from my Oyster Bay home, I was at the West Point Museum visiting with David M. Reel, Director, and Gary Hood, Curator of Art. I saw a section of the huge chain, and actually stood on the very spot depicted in this painting at the very same time of the year and the same time of day! The stars were truly aligned for me because it had snowed earlier in the week, just the way it had some 230 years earlier. On January 5, 1778, Alexander Scammel was appointed George Washington's new Adjutant General, the seventh in the brief history of the Continental Army. Pickering remained at West Point with Washington and would go on in 1780 to become Quartermaster General of the U.S. Army. This gave me the opportunity to paint both the acting Adjutant General and the previous Adjutant General in the same painting. Colonel Scammel would remain in his post until 1781, when he was succeeded by Brigadier General Edward Hand. Colonel Pickering is seen in the painting pointing out to Washington the locations of some of the redoubts and batteries on the eastern side of the river. Also with Washington at West Point was his aide-de-camp, Lt. Col. Alexander Hamilton, later to become first U.S. Secretary of the Treasury. He is seen here in a cape just to the right of the "Betsy Ross" type flag and astride the brown horse with the blaze. Moving to his immediate right is the famed Marquis de Lafayette. Next, to the right, is Baron von Steuben in the European style cape. He is in front of Washington's all blue Headquarters Flag with the six pointed stars, preserved to this day at Valley Forge. Directly under the flag is Colonel Tadeusz Kosciuszko and Captain Thomas Machin, the chief engineer on the project. Machin is not shown clearly as there are no portraits of him known to exist. The white flag over to the left is the regimental flag of the Commander in Chief's Life Guard. Mounted members of the Guard run off to the left of the flag. In front of them and at the extreme left of the painting are some of the enlisted men warming up at the fire, taking a break and getting some nourishment. The lifting devices, like the capstan, lever, block and tackle, are all easily portable and go back to ancient Roman times. The chain was made of formidable 2½-inch thick iron, each link was twenty six to thirty eight inches in length, weighing approximately one hundred pounds each, with nine or ten links to a section, plus a huge joining clevis and a swivel. It certainly was effective. The British never attempted to break it. The best source and the most interesting book on this fascinating story is The River and the Rock: The History of Fortress West Point, 1775-1783 by Dave Palmer. Chaining the Hudson by Lincoln Diamont was also of great value and very informative. "Washington's Watch Chain" - the nickname the troops used at the time - turned out to be one of the most interesting, difficult, and most gratifying paintings I've ever done in sixty years of painting professionally.